Maisie PriorAfter a strong performance throughout her studies, an award-winning student from Bangor University graduated this week. 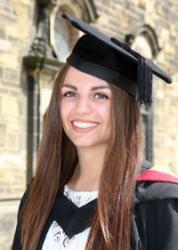 As well as graduating with a first class BA Spanish with International Experience degree, Maisie Emily Prior, 23, also won the Dr John Robert Jones Prize of £1,000, which is awarded annually to the best students across all disciplines at the University. During her time at Bangor University Maisie has also been awarded the B-Enterprising Enterprise and Innovation Award, BEA 200, UK Higher Education International Unit-sponsored prize for the best ‘Yarn’, runner up in UCAS/The Times Love Learning competition, Santander Universities Enterprise Award and a Santander Mobility Grant. Dr Anna Saunders, Head, School of Modern Languages and Cultures, said: "Not only has Maisie produced outstanding academic work, but her engagement with university life has gone above and beyond expectations. As a Peer Guide, a mentor for fellow university students and school pupils based in the area, a successful entrepreneur and an award-winning writer, Maisie has excelled at all the challenges she has taken on during her time at Bangor. I have no doubt that will be hearing much more about Maisie in future years! Maisie, who comes originally from Littlethorpe, Leicester, said: “I came to Bangor for its stunning location and friendly-feel. During my 3rd and 5th year I had a part-time job working in the Study Skills Centre as a Peer Writing Mentor, which was a brilliantly flexible position that consolidated my love for both academia and teaching. My business ‘The Luxury Copywriter’ also hit the ground running during my 4th year, but I made sure to switch on my ‘out of office’ if I had any important university assignments coming up! “I think setting up ‘The Luxury Copywriter’ has been my most significant venture, especially as it spawned from an accumulation of different work placements, internships and extra-curricular courses. However I am proud to say that the hard work has paid off, as I now count 5-star hotels, world-renowned fashion houses and even diamond designers among my clientele. “As part of Bangor’s School of Modern Languages and Cultures I was able to spend a year at the University of Santiago de Compostela in Spain, which was fantastic as it allowed me to network with other students from all over the world, as well as pick up Italian which I then went on to practice by spending the summer as an Au Pair in Venice.